4th Edition of Bangalore’s prominent Extreme Metal Fest, “Trendslaughter Fest (TSF)” is scheduled to be held on the first day of February, 2014. Trendslaughter Fest has been acknowledged superiorly within the Extreme Metal scene of India and it has even gained notability among the Metal Maniacs from other countries. TSF’s journey was initiated on 2011, where Bengal Death/Thrashing Aghori “Orator” headlined along with the support of local bands like Dying Embrace, Bevar Sea, Gorified and Culminant. International acts like Abigail (Japan), Cauchemar (Canada) and Blood Division (Singapore) have been summoned in the later editions of TSF. But without any doubt, 4th edition will surpass all of the sumptuousness of the previous edition since the “GOATFATHER” of Asian Extreme Metal scene “Impiety” is going to ravage as the headliner of the fest. Orator (Bangladesh) will revisit Bangalore and will co-headline the fest along with the primitive Death/Doom Monger Dying Embrace (Bangalore, India). 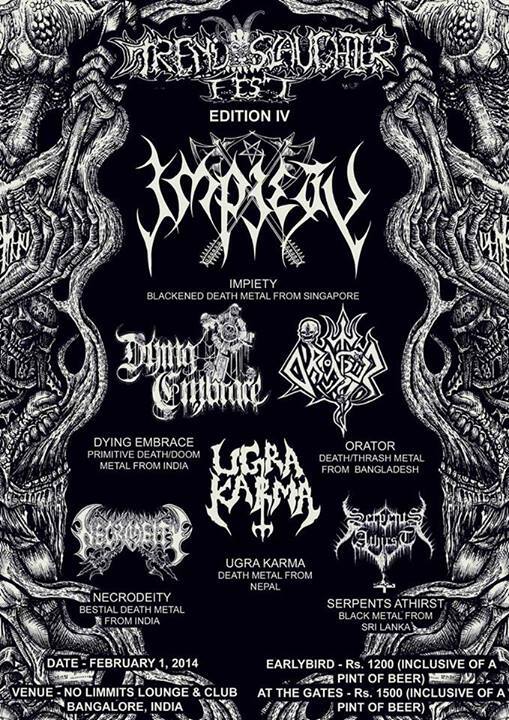 Other supporting acts are Ugra Karma (one of the oldest Death Metal Band from Nepal), Serpents Athirist (Filthy Black Metal from Sri Lanka) and Necrodeity (Bestial Death/Black Metal from Kolkata, India). Addition of the Masters of Darkness, “Impiety” in the lineup has taken the extremity of this edition to a paramount level. Many big bands of Metal arena have stepped into India, but TSF-IV will be one of the best Underground Extreme Metal Live Event for the metal fanatics of India.